The AIR 1.5 update to Adobe’s flagship RIA platform is here, and with it a host of new features to supercharge your development. 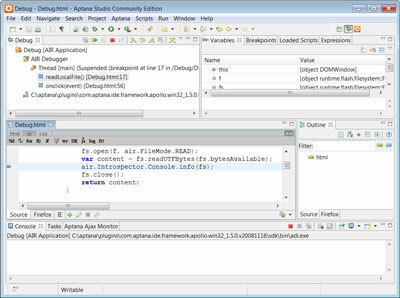 In this article we’ll look at the fantastic new debugging system, available in the Aptana IDE. Once again there will be a quiz at the end, so pay attention! The first 200 people to submit their answers will receive a copy of The Adobe Flash Platform ActionScript Reference for Rich Internet Application Development (that’s the print version) delivered to their door for free, thanks to Adobe. Before we begin, make sure you have the latest update to Aptana and to the AIR plugin. 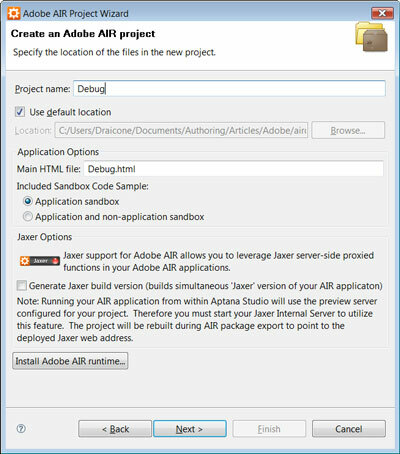 You can install these using the instructions in our previous AIR article, under the section, A Powerful Tool for Building AIR Apps. The latest updates are critical for this tutorial; if in doubt, restart Aptana and check for updates using Help > Check for Aptana Updates Now. You should have at least Aptana Studio 1.2.1 and the Apollo/AIR plugin 1.2.1. 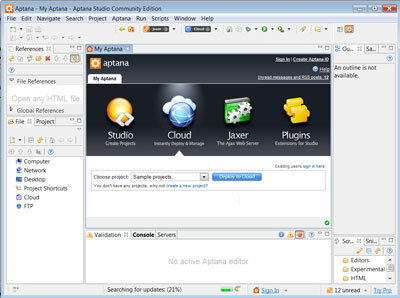 Use Help > About Aptana Studio to check your Aptana version, and click on the brown box to check your Aptana AIR version. Everything we need to take the debugger for a spin is included. We’ll be using the Adobe AIR 1.5 application template, the AIR Introspector framework, and the jQuery framework. 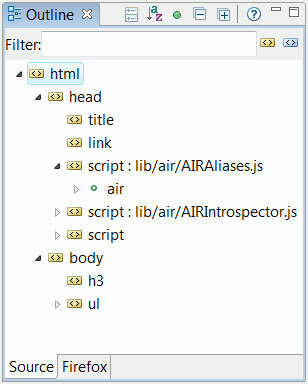 The AIR 1.0 release included a useful but limited debugging tool in the AIR HTML Introspector. With the new tools in the AIR 1.5 debug launcher, Aptana has managed to recreate the debugging workflow in Aptana Studio, and provide step-by-step debugging, breakpoints, watches, and more. 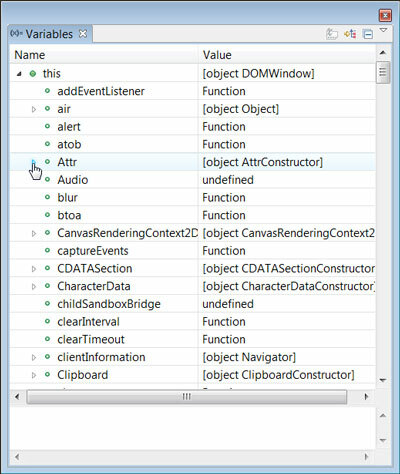 In this tutorial, we’ll run through how to debug AIR projects from start to finish. Veteran AIR developers can skip ahead to the Debugging on Wheels section. Most of this workbench is irrelevant to AIR debugging, so we can simplify the perspective by closing all the views except Project. 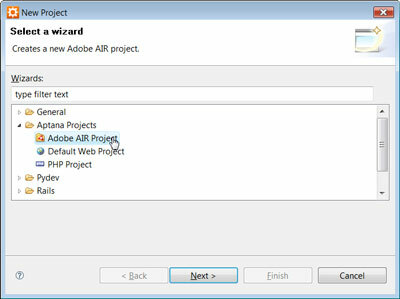 Let’s create a new AIR project; open File > New > Project under Aptana Projects, and select Adobe AIR Project. Click Next and give your project a name – I’ve chosen “Debug”. Click Next, accept the default Application Properties, and click Next again. 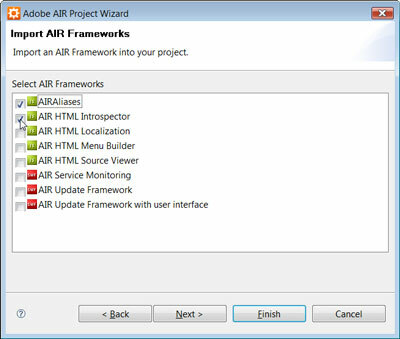 The default Window Options should be fine so click Next once more, and the Import AIR Frameworks dialog appears. We’ll need AIRAliases and AIR HTML Introspector for this project. The latter remains unselected by default so add it and click Next. Click OK (or similar, depending on your OS), and head back to Aptana. The Console view should appear below your code window. 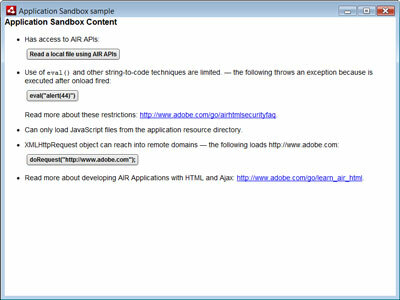 The AIR architecture closely mimics the Flash debugging approach â€“ applications can “trace” messages, which are then sent back to the parent application, typically the AIR Debug Launcher (“ADL”). In this case, Aptana receives these debugging messages and sends them to the Console view. Of course, dumping text to a console is useful, but what if we want to look inside the script execution, and examine objects? 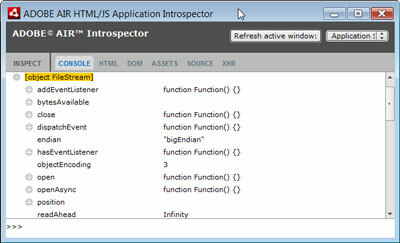 Bring on the AIR HTML Introspector, the Firebug of the AIR world. Logging our debug messages to the console is useful, but the Introspector can go one step further: have a look at the [object FileStream] in the console window. This indicates that we’ve sent a FileStream object â€“ sure enough, var fs = new air.FileStream() — to the console. Click the gray plus symbol (+) on the second line to view the object. 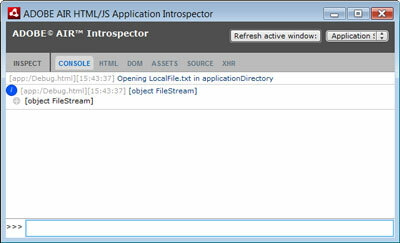 You can inspect objects and manipulate them in real time using the >>> prompt at the bottom of the window. For example, we could choose to keep our file stream open during the script, call a few of the methods of the object from the console (by assigning the object a reference in a global variable), and then run fs.close() manually once we’re done. 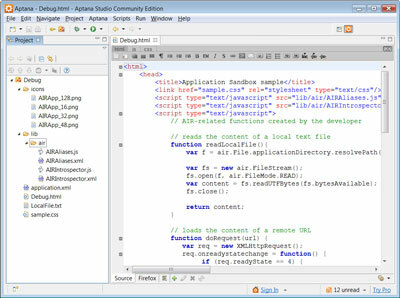 With the AIR 1.5 update and the Aptana Studio 1.2.1 release, Aptana and Adobe have created an amazing debugging platform, taking advantage of the power of Eclipse to give developers more features than ever. Let’s have a look at just how this new platform can help. While the debug perspective presents quite a busy interface, you’ll appreciate having this power at your fingertips later. Let’s have a look at the different views in this perspective. The Debug view (no relation to our project name) provides a basic stack and control panel for script execution. 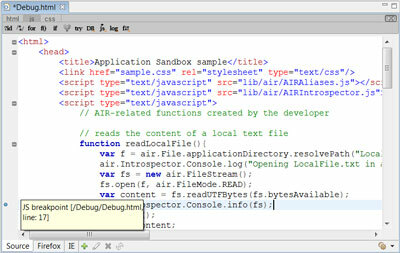 Here, it lists the AIR Debugger control, which manages the script execution thread, as well as the AIR Debug Launcher (ADL) server. Clicking any of the entries in the stack trace will navigate the open editor panel to the correct file and line, helping you quickly walk through code. Docking this view fails to do it justice. Right-click on the Variables title tab, click Detached, and resize the resulting window as you see fit. (Alternatively, you can dock it to the side of the workbench, in return for horizontal screen real estate.) Much better. Expressions is next. Similar to Variables, Expressions allows you to watch the value of an expression in real time. This could be a simple variable, or it could be a function call. For example, I often use the Expressions view to check DOM nodes on a page matching a certain CSS selector while jQuery is loaded. To use the Expressions view, add Watch Expressions using the first button in the mini toolbar. Let’s create a Watch Expression. But first, let’s resume the script execution: hit the Resume button back on the Debug view. 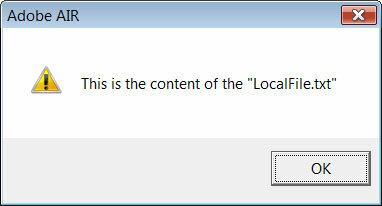 The alert box reporting This is the content of LocalFile.txt will appear, but it may be hidden under your Aptana window. Seek it out and hit the OK button, or your AIR application will object. Our AIR application is now back in action, and the Debug view will report a “Thread [main] (Running)“; we’re now ready to add an expression. Try a simple one, like window.innerHeight, and explore the result. Finally, we have the usual Console view. 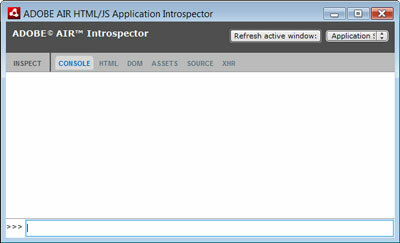 If we use the AIR trace debugging approach instead of the Introspector, we can send output to the console. This is even exposed to the Flash Player runtime when evaluating expressions, so you can create a complex expression with an embedded function and send some output to the console. Debug while you debug! In the mean time, test yourself on the contents of this article by taking the quiz. The first 200 people to submit their answers will receive a print copy of The Adobe Flash Platform ActionScript Reference for Rich Internet Application Development, delivered to their door for free, courtesy of Adobe. Take the quiz now!